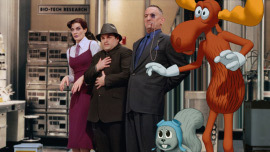 THE ADVENTURES OF ROCKY AND BULLWINKLE - One of the few really entertaining releases of the summer, and of course, almost no one has seen it. In this update of the popular TV cartoon, director Des McAnuff and his screenwriters have a field day with the film's escalating series of verbal puns and visuals riffs, and there are enjoyable turns by the likes of Robert De Niro, Rene Russo (born to play Natasha), and Piper Pearbo. While the film's roster of guest stars yields little humor, and it doesn't hold a candle to the frenzied delirium of the TV show, there are numerous laugh-out-loud funny moments, and when you're not laughing, you're likely to be smiling. Everything Old Is...Old Again: "Coyote Ugly" and "The Replacements"
Most genre flicks in the '80s were pretty crummy, but what absolutely terrifies me is that now, on the verge of a new millennium, we're actually being presented with homages to the crummy movies of that decade: Coyote Ugly, from uber-producer Jerry Bruckheimer, is a nod to the Jerry-produced smash Flashdance, and The Replacements is a paean to professional-doofus sports movies like Major League and Necessary Roughness, with Gene Hackman on hand to remind us of the coach he played in 1986's Hoosiers. 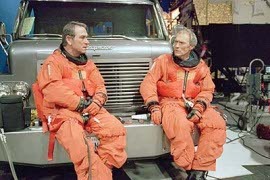 Sci-fi Misfires: "Space Cowboys" and "Hollow Man"
There's so much goodwill invested in Clint Eastwood's Space Cowboys, mostly stemming from its venerable and accomplished cast, that I feel like a killjoy for saying that the movie itself is really mediocre. University Profs, University Students: "Nutty Professor II: The Klumps" and "Loser"
You know exactly what you're going to get out of Nutty Professor II: The Klumps, and for the most part, that's a good thing. As the title indicates, the movie is more spin-off than sequel, as Eddie Murphy gives life to the Klumps, the vivacious and often beyond-vulgar kin to Sherman Klump, the obese genetics professor of the 1996 film. 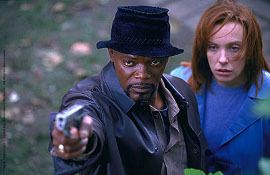 Making a Killing: "What Lies Beneath," "The Big Kahuna," and "The In Crowd"
As far as I can tell, the only people who might enjoy Robert Zemeckis' supernatural thriller What Lies Beneath are the ones that haven't yet seen its trailer, but I'm not sure if anyone qualifies anymore. That's not just because the omnipresent trailer gives away far too many plot twists, but seeing the preview makes watching the entire first hour of the film pointless. Movie trailers have been getting worse and worse about providing too much information; this is the first time they came close to spoiling an entire movie for me. Freaks and Geeks: "X-Men," "Disney's The Kid," and "Scary Movie"
Movie reviewers kill me sometimes. The same critics who raved about the "kinetic thrill-ride" that was the senseless Mission: Impossible 2 and who called the ridiculous The Patriot "passionate and engrossing" are now turning up their noses at Bryan Singer's X-Men adaptation. 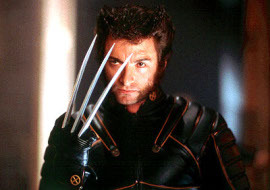 According to most news sources, the movie is portentous, under-plotted, filled with too many characters (or, for X-Men fans, too few), and serves as nothing but the setup film for an obvious franchise. Moose and Squalls: "The Adventures of Rocky & Bullwinkle" and "The Perfect Storm"
Revolutions: "The Patriot" and "Titan A.E." 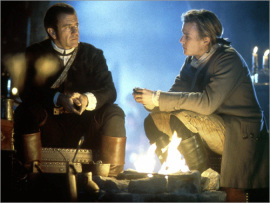 In this analysis of The Patriot, the Revolutionary War saga starring Mel Gibson, let's begin by addressing that which is mostly blameless - Caleb Deschanel's cinematography. Whether lensing a battle scene, featuring what appear to be thousands of extras in red and blue coats, or a romantic tableau in the moonlight, Mr. Deschanel's work is impeccable; he's one of the best in the business. Ditto the folks behind the set design and costumes, which look marvelously right in their period detail and lend the film more than an air of authenticity. Funny Business: "Chicken Run," "Me, Myself, & Irene," and "Boys & Girls"
To discuss the numerous, simple joys of Chicken Run is to risk ruining what's great about the film; how beautifully it's underplayed, and how sly and gentle its considerable streak of humor is. 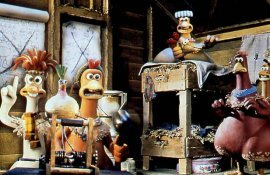 Using Nick Park's miraculous Claymation, the film tells the story of a group of miserable, caged English chickens who are trying, in vain, to escape from their evil human captor (voiced by Miranda Richardson). Their days appear numbered until the arrival of Rocky (Mel Gibson), an American circus-escapee known for his "Flying Rooster" act. The chickens' hope is that he'll teach them to fly away to safety; Rocky's hope is that they won't discover he's a fraud. Fun Flicks at Last! : "Shaft" and "Fantasia 2000"
For about a month now, when friends have asked me what new movies they should see, I've come dangerously close to drawing a blank. I'd mention Gladiator (which, naturally, most of them had already seen) and Small Time Crooks (which, sadly, most were uninterested in). Then I'd generally guide them in a different direction altogether, like Paul Thomas Anderson's magnificent Magnolia, which recently returned to Moline's discount cineplex. Or video and DVD, with the recent release of two extraordinary documentaries: Chris Smith's hilarious and touching American Movie, probably the best film of 1999 that wasn't seen locally, and Errol Morris' disturbing but brilliant Mr. Death: The Rise & Fall of Fred A. Leuchter, Jr.